DukeEngage in Chicago: Using hip-hop culture, literacy, and audio engineering as pedagogical approaches to developing and engaging urban youth as educated agents in their communities. Faculty program directors are Kisha N. Daniels, EdD, and Mark Anthony Neal, PhD. DukeEngage in Rwanda: Optimizing local resources to provide farm-grown meals to hospitalized individuals and equip their caregivers with knowledge on nutrition, health, and sustainable farming practices. Faculty program director is Emily Esmaili, DO, MA. DukeEngage in Peru: Conserving environmental resources through construction and education-related initiatives in the Cusco region. Enhancing fair trade practices to complement the conservation efforts in indigenous communities in two main areas: community tourism and traditional weaving. An English literacy program at school and another targeted to the tourism entrepreneurs complements the program. This program is organized by Global Vision International (GVI) in collaboration with DukeEngage. William Villalba, PhD, is the Faculty Fellow for the program. DukeEngage in Puerto Rico: Partnering with organizations fostering innovation in the energy and environmental sectors to promote sustainable energy infrastructure and economic development. Faculty program director is Lori Bennear, PhD. The application deadline for international group program applications is November 1, 2018, 12pm EDT and the deadline U.S.-based group applications and all independent project applications is January 23, 2019, 12pm EST. 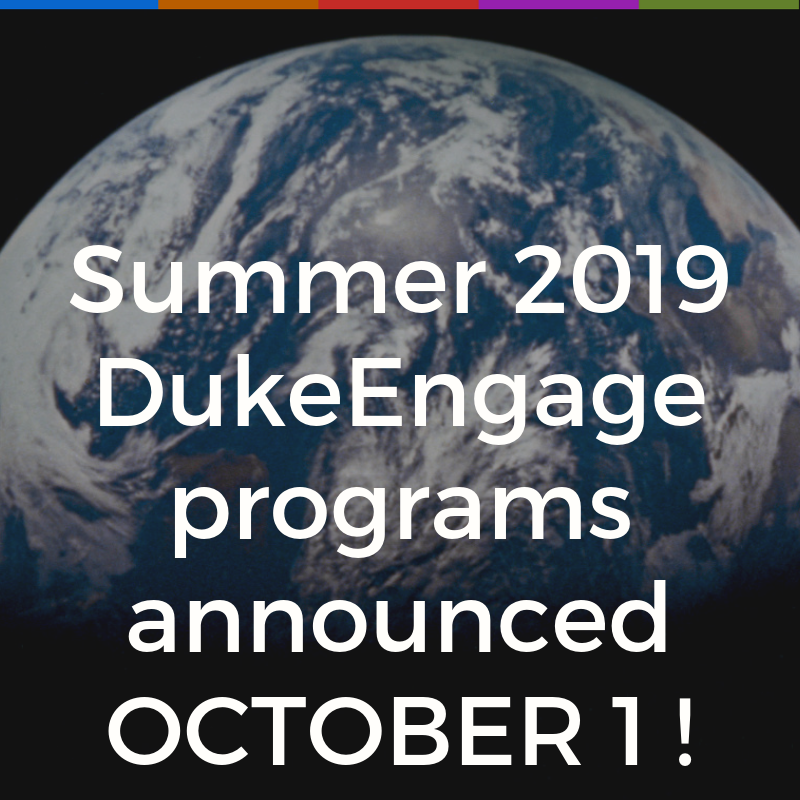 Approximately 400 students will be accepted for DukeEngage summer 2019 participation. The application is accessible via the DukeEngage website: http://dukeengage.duke.edu. In all, a total of 36 group programs are offered for the summer of 2019: 15 U.S.-based and 21 international programs. DukeEngage independent projects, in which students design their own individual summer project with a community partner, will also be considered in cities across the U.S. and abroad. For the summer of 2019, there are 40 available slots for independent project candidates. DukeEngage provides full funding for select Duke undergraduates who wish to pursue an immersive summer of service in partnership with a U.S. or international community. As of summer 2018, more than 4,400 Duke students will have volunteered more than 1.5 million hours through DukeEngage, working alongside more than 600 community organizations in 42 U.S. cities and in 81 nations on six continents.